Antony Hall‘s projects explore the way we interface with technology, and how our interactions with it influence us creatively and socially. Often collaborating with scientists and technologists, Hall is currently focusing his talent on the investigation of biological and physical phenomenon. Some of his recent experiments involve communication with an electric fish, the creation of life through growing crystals electrically on volcanic stone, hunting for Moss bears and training Planarian worms. 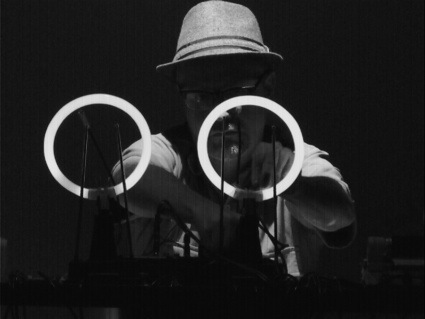 He gained fame in the media and media art festivals with his electro-acoustic sound art devices and performances. 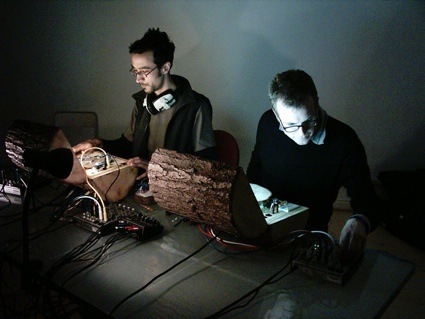 Together with Simon Blackmore and more recently Steve Symons, Hall is a founding member of the Owl Project, a group which combines woodwork with electronics to create performances, musical instruments (iLog , and Log1k) and other physical computing projects. Let’s start with one of your most popular projects: the iLog. How did you get the idea of making it? The iLog was created as collaborative project with Simon Blackmore and Steve Symons, we are the Owl Project. We developed the Log1K in 2001 as a performance tool to attempt rival the laptop in electronic music, shortly after this apple started pushing the iPod and we had to make a response, something which related more to the trend for portable, mobile hand held technologies. We wanted our devices to be a synthesis of craft and technology, as well as functional instruments. The Log1ks were getting increasingly heavy, among other things they used nearly 30 AA batteries, short circuits and fires, and blown-out speakers were becoming common place. iLog 01 came out in 2003. After we started collaborating with Steve Symons, we reinvented the electronics inside the iLog and started pushing the whole project to a new level; the M-Log is out later this year. There’s now a series of iLog models. Why do you think people buy the iLog? Mainly as a beautiful and quirky piece of art which they would not use too much fearing that it might be damaged (although you provide technical support.)? Or have you found that people use it extensively as any other kind of musical device? Were you expecting your project to have so much success? I suppose people want the iLog for its quirkiness, something as an alternative to the mass produced items. We had no idea that it would become so popular – people blogged it like mad at the start and like a Chinese whisper it suddenly became what people wanted it to be; typically some kind of alternative to the ipod – But in reality its something quite different. It is intended to be an instrument for performance. Our problem is that although there is demand; making them is still very difficult, and time consuming, so our focus is making them better rather than faster. At the moment we are looking at lending these to artists and working in collaboration to develop the iLog further. When we launched them for sale in London at DWB it was a real learning curve. Simple things like which way up it should be held, were completely un-obvious! We had to create extensive instructions regarding use, as well as repair and maintenance. The 24 hour support is most necessary! Its important that its more hands on than your average mass produced plastic device. The iLog is something people can use, rather than living all its life in the art gallery. The new series, *M-Log, launching this year, looks like an iLog, and is a USB connective interface. So there is scope for programming your own sensor based instrument, which you can use with your own customized patch. The iLog is more of a stand alone sound generator. We are planning an event in Manchester during Futuresonic where other performers (including Leafcutter John) will be using the iLogs & M-Logs. *The M in M-Log stands for ‘muio’ as in “muio interface”, the chip based interface inside which Steve‘s invention in his words “The muio interface is a modular system for sensing and controlling the Real World”. The wood is quite resilient and very repairable if damaged. I love The Sound Lathe, a performance which explores the sonic properties of wood. Do you have any video of it? It does look like a very physical performance. Did you have to master new skills in order to be able to do these performances? How does each performance go? Are they all different from each other? Does working with wood creates situations and results you wouldn’t have expected? Yes its been really interesting – my self and Simon ended up sleeping in a kind of bivouac deep in the forrest as part or the “R&D” for the project, learning the skills of traditional “green woodwork”, (electricity free) with Mike Abbott, master crafts-person. Mike invented a competition for Bodgers (the name for people who use the ‘pole Lathe’) called ‘Log to Leg’ (as in chair leg) so this is the new format for our performance – I think the record is 9 mins; transforming a bit of tree stump, into two perfect chair legs! It takes us a couple hours, but then our lathe is connected to copious amounts of sensor interface technologies. Quite a distraction, if like for our last performance at Lovebytes, it rained torrentially for the whole thing. In the documentation you will see a tarpaulin underneath that are 3 laptops and Simon. I think for all of us it’s a welcome change from sitting behind a screen the whole time – these physical processes are a great compliment to programming and electronics; and they still require a similar kind of focus and discipline. It is quite exhausting, you need a lot a focus to keep the beat in time as well as make a good carving, in this way it becomes quite mediative. Sharpening the chisels and preparing the timber are all equally demanding skills to learn. Can you tell us something about the wooden objects produced during the performances? Which kind of objects are there? And what do you do with them once the performance is over? We have a box full of various objects; ranging in description from ‘chair leg’ to ‘fire wood’, or specialist ‘rolling pin’. Occasionally we have a look inside & discuss what we should do with them. We did make a chair with Mike about the only truly useful thing we ever made. The latest idea is to make some kind of flat pack, or player. Watch this space. You can see what we decide to do with them at The Piemonte Share Festival, 11 – 16 March 2008. You are also interested in bio-digital medicine. That sounds very different from a project like iLog. Can you explain us what it is and how you started to be interested in this field? Well this is my own personal project, although I have always working with biology or technological experimentation in some way; with ENKi I decide to humanize what I do. This was a decision to move into medicine and treatment technologies. Really its the same things that we work with in the owl project; looking at how technology is consumed and sold. The notion of bio-digital medicine is just one example in hundreds, of how science, or even the suggestion of science is used, and misused to sell ideas. Faceless corporations feed on our anxieties, our basic need to feel contentment or feel complete. I find it interesting that, just as some people turn to religion, others will look to technology or science to provide answers and solutions. ENKI uses the bioelectric information from an Electric Fish to trigger human Brain-wave Entrainment. It generates sound and light pulses to induce a state of relaxation similar to the way traditional relaxation systems work, but the electric communication signal comes from an electric fish rather than a chip. Did you test the system on other people? How do they react? So far we have tested it on about 40 volunteers,most of them members of the public who had no prior knowledge of the project. We did this in the context of the Manchester Museum of Science and Industry; people enjoy the experience generally. I was surprised at the range of people who were up for it! By this point I had started working with Greg Byatt as a collaborator. He has experience of using this kind of technology and administering similar treatments professionally. Greg has equipment which can monitor your physiological state and a brain-wave visualiser (EEG); we were trying to measure results this way. We only really came to one solid conclusion. We had to do more tests. Isn’t the idea of putting one’s “brain-wave entertainment” into the fins of an animal scary? Do you feel that people would trust any other electronic device more than a fish or any other type of animal? That is a good question. It’s an exciting notion this whole idea of “wet-wear” interfacing – but not something that should be taken lightly. I don’t like to be on my own if i am doing a test run, and yes I find it very unnerving. I never quite got used to the idea of connecting strangers up to electrodes and the fish. I also worry about the fish. The fish needs to be content and ‘happy’ for this to work. In my opinion that most of these commercial devices are made by various humans all of whom have different intentions and issues, namely cost efficiency; and so effectively using quite crude means; cheap microchips. The Black Ghost knife fish is the result of millions of years of evolutionary refinement; but you could still say the same of micro chips. Is that project completely developed or is it still a work in progress? It’s in progress. I started working with “electrogenic” fish in 2005; ENKI technology was the title I gave it in 2006 when I was in residence at ENSAD in Paris. This was the point I realized I could create a treatment technology that might actually be functional. I had a bit of pressure to actually finish something and so launched the basic concept of ENKI technology. The funny thing was that reflecting on it now – that just marked a new beginning. (It took a year just to convince the director of Pepiniere that it was in fact a real project and not some conjecture in science fiction!). Coming to think of it I have never really finished anything, I am much more excited by the notion of continued experimentation. I don’t want to finish discovering. The more I work on ENKI – the more things there are to do and try, it keeps opening up. There are always more questions. What is there left to achieve? And how much have you learned about cross-species communication? There is still a lot to achieve. The ‘treatment’ side is just one layer of the onion. I started the project with the aim of communicating with the fish, generating an electrical signal and transmitting this in the fish in the tank, to the fish. Then I watch the the fish, looking for behavioral ‘interactions’ with the electrodes – generally if there is an electrical (connective) change to the electrodes, the fish is aware of this and investigates the electrode by swimming near it and around it (motor-probing responses). I also listening for a ‘chirp’ response. The ‘chirp’ response is a subtle modulation of the Electric signal, a specific fluctuation in the wave. The ‘chirp’ is used during like species interaction and communication. This is closer to the idea of language we have. Experimentally there are factors which make this difficult to measure – The fish learns to associate the vibrations created by me entering the studio & opening the tank with a food reward. So any approach to the tank needs to be made silently, and the fish needs to be ‘conditioned’ to learn this over a long time. As the project progressed I became more interested in communication as something closer to an idea of commune. For the fish I see the communication signal they make more as a deep expression of self; a projected physical extension of the fish body, rather than ‘language’ in an anthropological sense. This communication is happening at a more primal level. In terms of the ENKi project I am thinking about this as a biological, or physiological connection between living organisms. I recently discovered that I might be having a problem with what is known as ‘superstitious’ behavior in the fish; if I was a scientist in the academic sense, this would be a serous flaw in the project; something to fix, but for me it was a fantastic turn, giving the project a new angle all together. Its now becoming an experiment into animal Psychology, not just electro physiology. I don’t want to say too much about this next phase but next year the project will look quite different. You recently developed the Opto-acoustic modulator and used it for an interactive work at FACT and Liverpool John Moores University for the National Science and Engineering Week. Can you give us more details about this interactive piece? How does it work? What were you trying to achieve with this project? The commission was to create and interactive art work that used something other than keyborad or mouse. I was determined not to use a video camera either. The the Opto-acoustic modulator basically turns sound-waves into light-waves. It can take 10 audio channels and convert these into “AM” transmissions through 10 Light Emitting Diode arrays. I am fascinated by the notion of ‘Amplitude Modulation’ sending data using light waves. The idea was to use ‘Hyalite’ salt crystals, to broadcast sound through their ‘ionizing’ ambient glow. 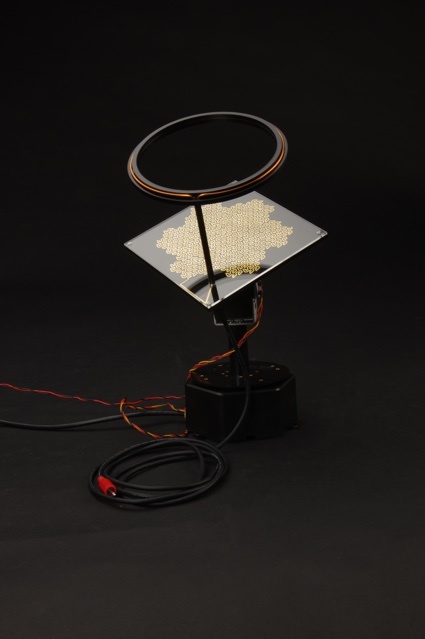 You interact with the light and can detect the data as sound using wearable sensors. Additionally, using Steve’s ‘muio’ interface again, 8 light sensors detect movement around the crystals using a lens and light sensor (based on the idea a simple biological ‘camera eye’) these feed into MAX MSP controlling a soundscape. I read on your statement page that you are currently “working on new experiments relating to the creation of life through growing crystals electrically on volcanic stone, hunting for Moss bears (Tardigrades; Fresh water extremophiles) and training Planarian worms. ” Could you already tell us a few words about these experiments? I have been researching the work of William Cross for quite a while, and finally decided that I needed to recreate his experiments (with a few modifications) It’s quite interesting trying to work out what he did – the only way to know is to recreate it. In 1837, he found these creatures “Acari electors” as he called them infesting an experiment, he believed that these things “spontaneously generated” within his experiment, several eminent scientists of the time recreated the experiment with the same results! 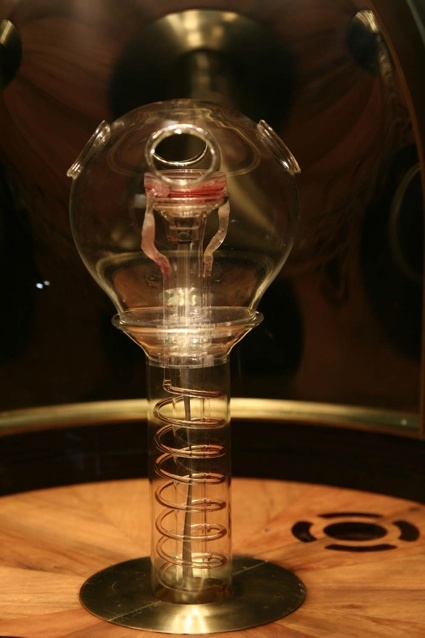 My experiment is basically a recreation of this experiment, augmented with a little more technology – with the aim of capturing this phenomena of electrochemical abiogenesis. The only problem is the experiment has to run for many months. I am interested in all sorts fresh water microscopic life; its a great 19h century tradition. With a decent microscope, you can take any roadside moss cluster and explore the interstitial oceans of liquids trapped between damp moss filaments. Here you might be lucky enough to find a Moss Bear ( “Tardigrade” ) an obscure form of extremophile that lives in moss. Believe it or not, it really does look like a bear! This in its self was a reason for laboring days over a microscope just to see if it was real! They don’t fit into the zoological classification system, and have been given a phylum of their own. It is believed it is able to survive space travel, and at this moment a small space capsule orbits the earth containing some “Tardinauts” (its hard to compete with that) I simply enjoy looking for them. I like to go looking for moss growing in all kinds of areas, from urban waste lands, to the Peak District. “Tardigrades” are able to survive about 120 years in a dehydrated state; I was sifting through very old moss samples from Manchester Museum to see if I could reanimate 100 year old dehydrated Moss Bears. apparently it is possible. I had a lot more luck looking for the living ones. Unfortunately my one Planarian worm recently went missing in the tank. It is 8mm long, and I dont have the heart to keep it in a petri dish. I am not sure where it is. Is there any artist or researcher whose work has been particularly inspiring for you? I don’t know where to start! Louis Bec for sure. I am really into what SymbioticA have been doing over the past few years, and what they are doing for the “Bio-art” movement. Otherwise, at the moment I am looking at the work of William Bebe. To be honest – I have been trying to read a lot more science fiction lately, particularly 19th century science fiction, and science writing. Often the science fiction tells you a lot about the popular understanding of science at the time. More importantly, its a good antidote ploughing through contemporary research papers. Related: El Niuton has a slideshow dedicated to the work of Simon Blackmore. 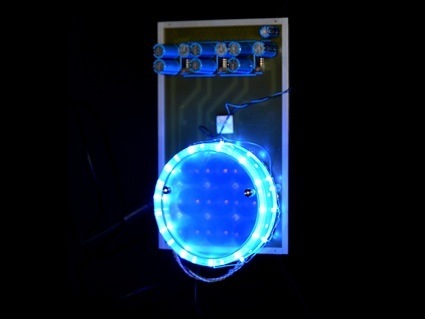 Posted in bioart, futuresonic, gadgets, interview, performance, sound. Bookmark the permalink.